Today's digital cameras have more hi-tech functions than ever before, and at the same time they're getting smaller and lighter. But something has to give, and all too often it's the control interface. Trying to access advanced features means scrolling through so many menus and options that by the time you've selected Sunset mode, it's time to use Night Landscape instead. The first of Samsung's NV range gets straight to the heart of the problem with a completely new interface called Smart Touch. It's based on two rows of touch-sensitive buttons (horizontal and vertical) that run alongside the LCD screen. The camera hardly looks revolutionary, with a modest 3x lens and pop-up flash at the front and a conventional 2.5-inch display and tiny zoom rocker at the back. But fire it up (which takes a couple of seconds) and you immediately notice that the NV10 doesn't use traditional menu screens. Instead, you get neat rows of icons matching the Smart Touch buttons. Stroke your finger along the buttons and each icon explains what it controls. Press the ISO button on the right for example, and you instantly get a menu strip across the screen - then simply run your finger across the bottom buttons to choose a sensitivity. Similarly, use the horizontal buttons to call up the vertical menus. This may sound over-complicated but it's actually extremely intuitive - and very fast: you can select spot metering, adjust the white balance and set exposure compensation in seconds. The Smart Touch system really comes into its own in full manual mode, adjusting aperture or shutter speed, or settings like colour and brightness on a scale. Instead of plodding slowly up and down, you just zip your finger from one side to the other, hitting the button when it looks right (or when the exposure warning says it's spot on). Beyond mere speed, the Smart Touch system is excellent in the dark, when you can't see the buttons. Stroking the buttons lets you know just what feature you're about to select. Unfortunately, the screen itself isn't quite so hot in dim light because it fades from its usual crispness to a dark and blurry mess. The rest of the NV10's controls can't live up to the Smart Touch. The zoom rocker is on the small side, and the lens is noisy and sluggish. The top-mounted Mode dial is clear and easy to use but, like many of its kind, has a tendency to wander between modes when stored in a pocket. Don't let the NV10's slim, almost elegant, metal case fool you, this is far from a dumb snapper. Among the advanced features on board are exposure bracketing, a clever Auto Macro mode for sharp close-ups and a good range of drive options. Standard continuous mode shoots at one frame per second (no limit), rising to 2.5fps if you're happy with just three frames. High-speed fanatics might enjoy experimenting with 7fps (at 1Mp resolution only) or the web-friendly GIF animation mode. In full Auto mode only, you can tweak brightness and colour temperature on a Smart Touch scale. This last option knocks the socks off manual white balance settings for quickly cooling incandescent lighting or warming neon. Many of you might be wondering whether you really need 10Mp in a compact camera, and the answer is simple: not when they're shot through the NV10's lens. Images lack definition, and noise is visible at all sensitivities, although it's only above ISO400 that it's visually painful. Fringing isn't too bad but distortion is pretty ugly, especially for a modest 3x lens. Exposure and colour rendition are much better. The NV10 excels at lively images fizzing with rich, bright colours. Autofocus is slow but usually finds its mark. Night shooting is less pleasant altogether. Framing is haphazard and you need to get up close to avoid the weak flash succumbing to noise. 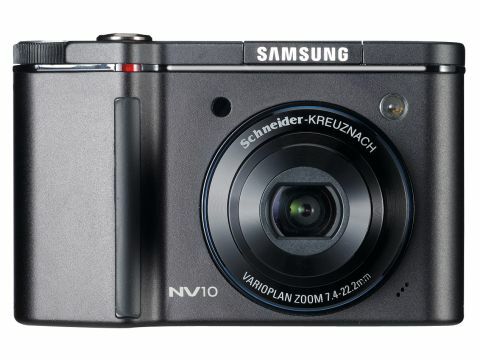 The NV10 is typical of Samsung's current product ranges, from MP3 players to LCD TVs. It combines a unique impressive feature (here, the Smart Touch interface) with high power (10Mp) and a low price.